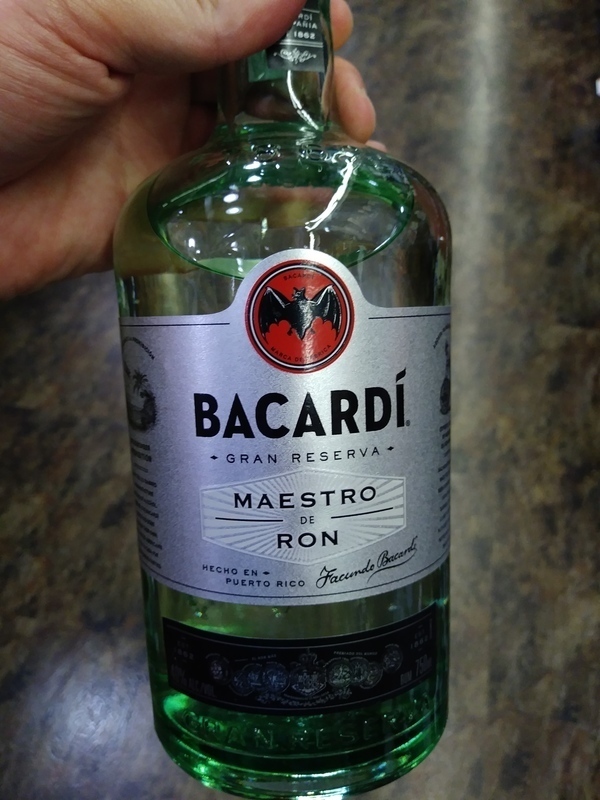 Have you found an online vendor selling Bacardi Gran Reserva Maestro de Ron? Sugar: 16 gpl. Surprisingly good white rum! Citrus and apple and pear notes in taste and aroma. Very smooth taste without the harsh burn or chemical tastes of the lower end white rums from Bacardi. This is one of the few white rums that could be a sipping rum as well as a high end mixer. As far as column distillates go, this is nice. Definitely mellow, with a classy quality that is hard to describe. It flows very eloquently across the palate, and fades with a pleasant toasty aftertaste. Overall very mild for my taste, but nice to have on hand, and nice to taste every once in a while. A classier daiquiri or Mary Pickford, maybe? An OK rum for a light rum. I remember seeing lots of good reviews on here when this first was released, but the $26 price tag kept me away. So, as I was walking through a newly opened wine and spirits clearance store near me, I saw plenty of these bottles going for only $13. Many of you already know that I absolutely hate Bacardi, but I also cannot pass up a good bargain when recommended by fellow reviewers. I poured an ounce into the snifter and let it breathe for about 15 minutes. No burn at all. The aromas were minimal. Super smooth tasting. Then I noticed lots of legs in the glass from being very viscous. I later found out that it has 16 gpl of added sugar. This is just one teaspoon shy of this rum being classified as "Sweet". This was obviously created to compete with the ever popular Plantation 3 Star Artisinal, which has 13 gpl of added sugar. Both rums are very similar. However, the Plantation is still a better value for a full liter. If you see a bottle of this rum for $17 or less, give it a try. I would not buy it again because I am getting away from rums with added sugars. However, the taste is good enough to sip neat, and not many white rums are capable of this. For those that hated this one, you must have gotten bottles from a bad batch. This rum got me to thinking that once a company creates a bad reputation for itself, there is not much they can do to bring that reputation back up. No one is buying this effort of a rum, which is why lots of it is on clearance. Also, it is now apparent that it takes a fair amount of added sugar to improve a bad rum. Bacardi makes a decent clean drink - good neat and a terrific mixer. Price point is right and the corked special edition is a nice addition to your bar. Bought the bottle to use for mixing drinks that should have white rum. Was surprised that the taste was smoother and cleaner than I had expected. Think there is some good rums comming from Bacardi even if they are doomed by a lot of people. A step up from their normal white rum. Still not really special but not a bad choice, would go for something else if i was looking for white rum and had a choice! Si quieres darle categoría a tu cockteles, este es el ron que te hará parecer un barman profesional. Un sabor peculiar acompañado de la frescura de un buen ron Bacardi. Offering subtle notes of plum, spice, caramel and vanilla. The palate is smooth with a well-balanced and clean finish. Great for mixing or sipping on its own. Slow filtered and aged for three years for added complexity and smoothness. From the many rums that I own ,this is the one my wife will drink. 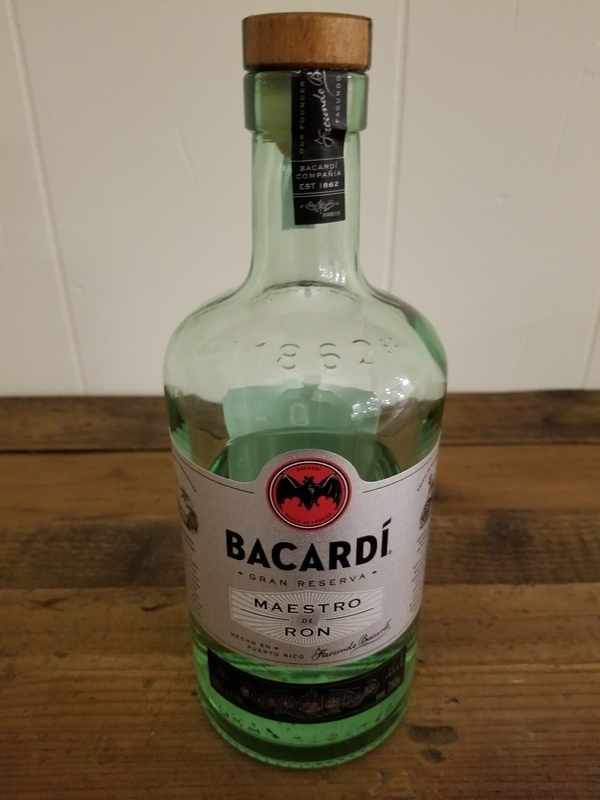 Bought a bottle of Bacardi Gran Reserva Maestro de Ron with interest, but the reality was quickly obvious, this is not a neat sipping rum and far away from the labels disclaimed "extra smooth sipping rum". There is a tiny improvement over the traditional silver Bacardi, but both of them are to be mixed with Coke. Tasted while smoking a cigar and it is perfect. Very smooth to and gentle to sip while smoking a good cigar. wish I can get a hold of another bottle. Smooth start, sweet flavor and aroma but finishes with the clasic bacardy burn. Good enough to sip for a bit. A very nice white rum sipper. I find it works better than the plain white in cocktails and is nice just with a little bit of ice. Very smooth with light coconut and vanilla and a hint of oak. Very good in a Famous captain cocktail with pineapple, sweet vermouth, lime and cinnamon syrup. Okay...I respect what others' opinion on this may be but I must vehemently disagree with the reviews saying this is a smooth rum and a sipping rum. In my humble opinion it's far from either. Straight up alcohol aroma in the bottle and snifter. Flat out harsh on the tongue. Instant tongue tingler. And a big burn. Don't know how they managed to get such a burn from only 80 proof but they did. The finish has a bitter chemical taste. Too harsh for a sipping rum. Definitely needs the sweet from fruit drinks and colas to counter it. So it's a solid mixer but completely unremarkable. Plenty of better white rums available for about the same price. A little more will get some exceptional white rums. Bacardi could have done better. I'm not usually one for white rum but this on the rocks works pretty well. Smooth enough to be sipped, but i thing is much better for mixed drinks. Great for a white rum, so extremely smooth it just disappears into mixed drinks. I thought for a moment it was hiding behind the ice cubes so I blended the entire concoction and received nothing but rave reviews from all my guests. More smooth as standard Bacardi, but it is too expensive for what you get. I enjoyed what I had but I wouldn't choose to have a second. Better sipping rums available! "This is a premium white sipping rum..."